More people than ever before are interested in streaming live TV services like Hulu with Live TV and YouTube TV. 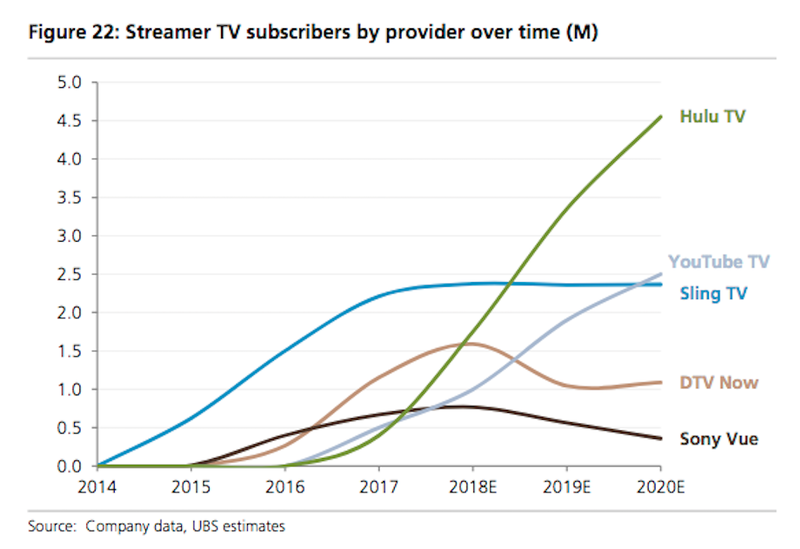 UBS predicts these newer services from YouTube and Hulu will have more subscribers than similar internet-based options launched by traditional pay-TV providers like Sling TV (by Dish) and DirecTV Now by 2020. Though UBS sees the demand for these services increasing, it also sees fewer people who will „double up“ by subscribing to both a streaming TV package and a cable or satellite one. 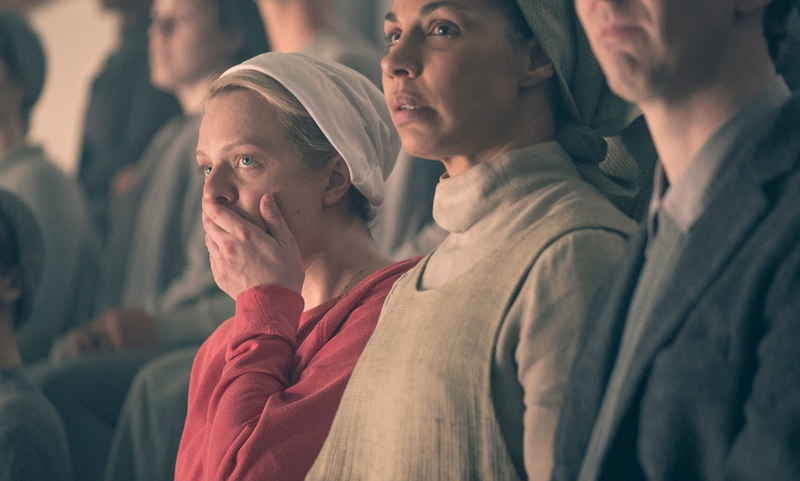 There is a power shift underway in the live TV streaming world, with bundles launched by Hulu and YouTube continuing to gain steam, even as the subscriber growth of similar packages launched by traditional pay-TV providers stall. In a report distributed Monday, UBS analysts predicted that Hulu with Live TV and YouTube TV would continue to grow through 2020, while Dish’s Sling TV would plateau and AT&T’s DirecTV Now would falter. 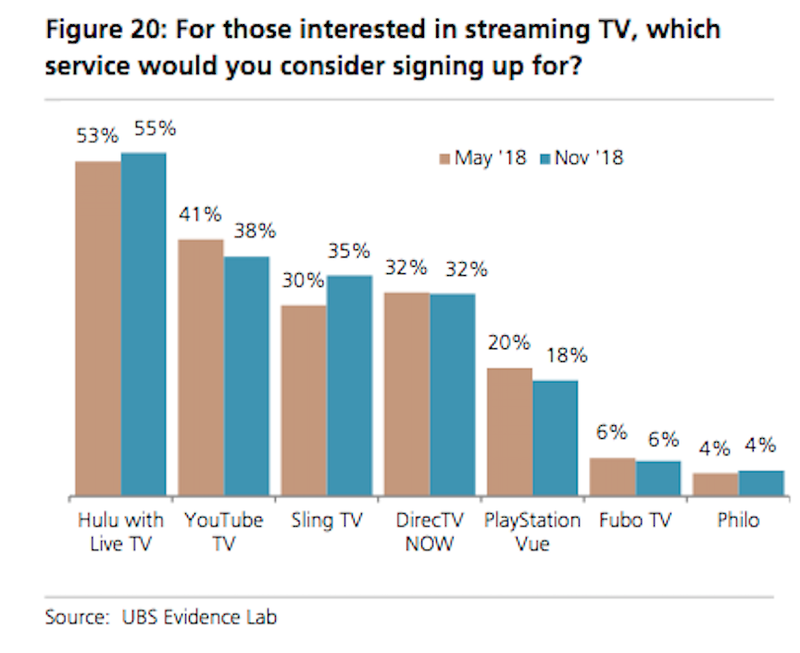 UBS based these projections partially on the strong consumer interest shown in Hulu and YouTube in a survey conducted in November. 55% of respondents to the UBS survey said they were interested in Hulu with Live TV, and 38% are considering YouTube TV. AT&T stunned the industry last month by sharing that DirecTV Now had lost 267,000 subscribers in the fourth quarter of 2018. UBS expects that negative trend to continue in 2019 as promotional pricing expires for many subscribers. While interest in streaming TV is rising, the UBS survey showed that fewer people were likely to „double up“ on services — subscribing to both an internet TV service as well as a traditional cable or satellite one — „reversing an earlier dynamic where customers kept both as they tested new platforms,“ the analysts said.